For questions regarding our Custom Drum Kits you may email us at the address below. Check out our featured artist page and video gallery. Drum Maker Of The Month: MCD Percussion. 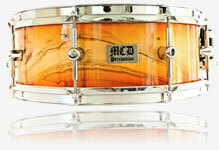 All MCD drums are completely custom, but they primarily build acrylics, maple ply drums and solid shells. “Our acrylics are really popular with guys in the hip-hop and gospel scene,” says Kyle. Olympics Solid Shell Blind Testing! View MCD's Online gallery's. View our entire line, select various materials to produce your custom drum kit.